Place the tomatillos in a medium-sized pot and boil until they are well cooked. Then let cool to room temperature. In a food processor or blender, process the tomatillos with the avocados, crema Mexicana, serrano peppers, garlic, (white) onion, chicken bouillon and four stems of cilantro. When fully blended, set aside in a large bowl. To prepare the enchiladas, first pre-heat the oven to 350°F. Then grease a glass baking dish (about 8 x 8 inches) with oil spray or your preferred shortening. Pour 1/3 cup of the avocado salsa into the dish, making sure to completely cover the bottom. Afterward, heat the tortillas over a griddle or comal for about 30 seconds, until the tortillas are soft and can be rolled easily. To the side, place three or four tablespoons of queso fresco over each tortilla, with a pinch of (purple) diced onion. Fold the tortillas like a burrito and place in the glass baking dish. When the bottom of the dish is full, cover with more avocado salsa and sprinkle with queso fresco. Follow-up with another layer of enchiladas on top, dressed with the remaining salsa and cheese. Bake at 350°F for 30 minutes or until the cheese begins to turn golden-brown. Garnish with fresh cilantro before serving. You can accompany this dish with refried beans, rice soup or a classic salad. Disfruta! 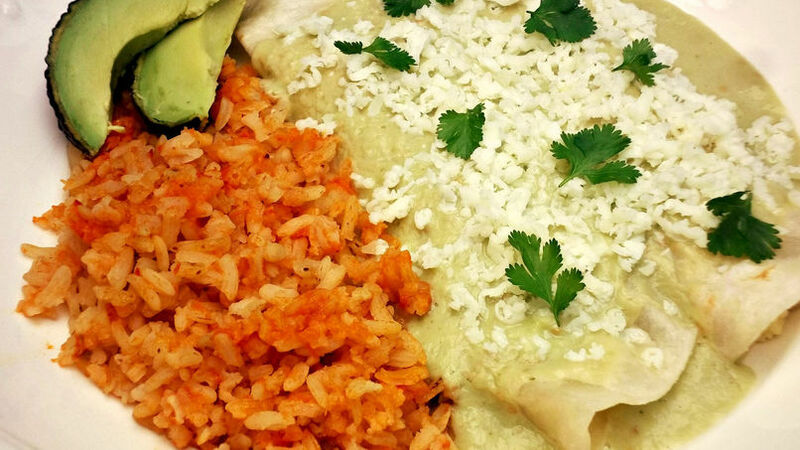 You can also prepare these enchiladas with flour tortillas. Avocados are one of the most frequently used ingredients in my kitchen-as a garnish, in guacamole, or as a special salsa for accompanying our favorite dishes. The avocado salsa I like best is made with tomatillos, serrano chili peppers and crema mexicana. This sauce is very versatile because it can be used to accompany almost anything from tacos to toast, and even dress a salad. But it’s absolutely rica when served over these cheese enchiladas-you’ll really discover the creaminess of the avocado in this recipe!